From the cost effective Solo product to the full featured LU600, chances are you’ll find the right product for your next live project. Even the smallest LiveU products can benefit from up to four connections (2 cellular modems, Wi-Fi and LAN) and leverages a unique video transmission method – LRT™. This allows you to deliver rock-solid content for broadcast or social media in practically every scenario – on the move and in remote or crowded locations. Visit EAR’s online store for pricing and feature details or call 800-473-6914 for a person run down on all the features and benefits. EAR also keeps a full demonstration equipment inventory for a “hands-on” test drive. 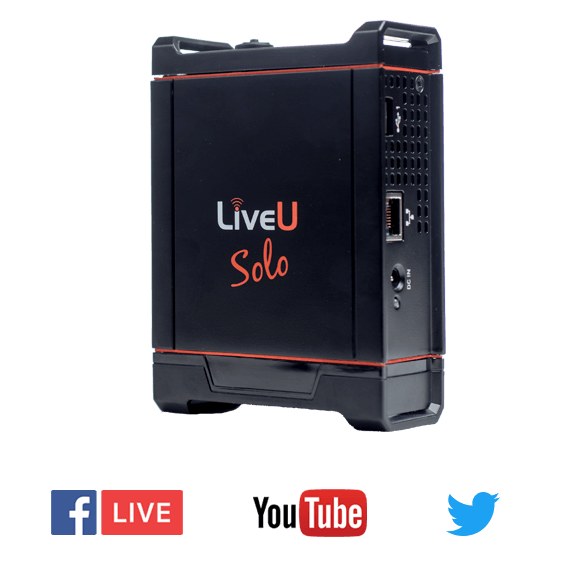 Checkout our LiveU specials page for great pricing, terms and support! LiveU’s wireless At-Home Production solution allows broadcasters to reduce costs by producing live shows from a centralized studio control room instead of on-site production and satellite trucks. Sending less equipment and crew into the field allows event producers to maximize their in-house resources and increase efficiencies across the board. LiveU can provide full broadcast quality HD and 4K content streams using the their patented bonding technology, “LRT”. Ask us about the cost effective Solo encoder at under $1,000. Already own the Solo? We can help you extended your warranty – we just need your serial number and EU information to process your order.Contact an EAR product Specialist for details and quick delivery! LiveU’s unique Reliable Transport protocol (LRT) is at the heart of LiveU products to deliver optimized video performance. LRT enables reliable, low delay live video streaming over non-guaranteed IP networks and ensures reliable transport over the most unreliable of networks, including cellular networks – allowing you to acquire exciting live content in even the most remote locations. Contact an EAR product specialist today for a remote or in person demo and see how LiveU technology can save time, money and help reach new media opportunities! EAR also features the LiveU and thousands of other products on our commerce site shop.ear.net.